Once upon a time, on a hot July evening, Anna’s car [well, it’s really Dad’s car] broke down. This was a very sad and complicated situation as it stranded her and Josh on the side of the road, caused them to miss a movie [Harry Potter and the Deathly Hallows II], and meant that in order to get to work Anna had to accompany her parents on an early morning breakfast date with some friends. John and Kathy Muether were travelling home from Ironbound Island and met Anna and her parents at Boynton-McKay in Camden, Maine for a nice breakfast. At this point Anna, who had remained relatively silent throughout the previous discussion, prayed that the very ground under Boynton-McKay would open up and swallow her. She slid down several inches in her seat and turned [she has been told] several shades of crimson. The Muethers seemed remarkably interested in the idea and, even after Anna left to go to work, apparently brought her up in the conversation a few more times. They even came up to Rockport Blueprint to purchase some paper afterwards and chatted with Anna some more. After the initial embarrassing moment Anna decided not to worry and put the potential arranged marriage out of her head. A few days later, when Anna came home from church, she had a new friend request on Facebook. “Tim Muether wants to be your friend” Facebook said. Anna accepted the request. Stephen and Sharon Tracey were thrilled at the swift and exciting outcome of their arrangements. They stalked Tim voraciously on Facebook for the next half hour and all of the Traceys teased Anna outrageously for a few days. Meanwhile Anna and Tim started sending messages back and forth online. Soon they upgraded to email. By September of 2011 Anna and Tim were emailing back and forth on a regular basis. They talked about matters of mutual interest and told funny stories from work. They never mentioned their parents’ attempt at an arranged marriage. When classes began again for Tim in September he began to find it harder to write the lengthy, newsy, banter-full email that Anna was used to. He also began to wonder where the friendship was going to go, because there seemed to be little chance that they were going to be able to meet. His emails became less frequent. Meanwhile Anna’s summer job had cut back on hours and, as she had extra free-time, she too began to wonder if anything would happen. Stephen Tracey and John Muether decided to take matters once again into their own hands. They arranged a conference specially designed so that their eldest children could meet. Russell Hamilton, of Pilgrim OPC, joined with the conspirators. They brought together all of their elders and deacons and had an office-bearer’s conference. John Muether spoke, and brought Tim along with him on the trip. Anna and Tim met on a Friday evening in early December. Anna made cookies in case Tim liked the “domestic type.” She also wore her favorite brown sweater, which she tore, tragically, in the middle of an excited/nervous/panic session about half an hour before Tim arrived. She had to meet Tim while wearing her pink sweater instead. The first “date” was helping the conspirators to collect the conference fees. Anna was the only girl present. All the elders and deacons from Lakeview and Pilgrim served as interested, while in-the-dark, chaperones. Over the course of the long weekend Anna and Tim got to know each other better and [even though Nathaniel tried to sit between them at the movies] they decided that they really did like each other and wouldn’t mind hanging out a bit more often. They made their relationship “Facebook official” in January when Anna visited Tim. Tim came back to Maine in March. 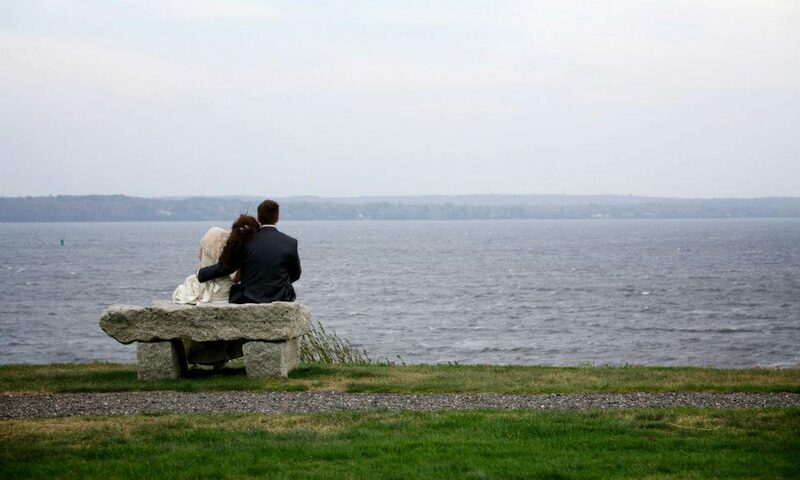 And so it went, until they got engaged, outside the King Eider’s Pub in Damariscotta, on June 5.